JERUSALEM (AP) — Over the years, the Israeli parliament has seen its fair share of questionable characters. But it’s unlikely anyone has ever been so perpetually engulfed in scandal in so short a time as freshman Likud lawmaker Oren Hazan. In less than eight months in office, Hazan has already faced accusations of physically assaulting a public official, sexually harassing women, pimping prostitutes and providing drugs to tourists at a Bulgarian casino. Now, after ridiculing a disabled lawmaker, there are growing calls across the spectrum to sanction him. But with Prime Minister Benjamin Netanyahu’s shaky coalition depending on the support of every single member, the Israeli leader is limited in what he can do. At a parliament session this week, Hazan was heard belittling Karin Elharar, an opposition lawmaker who suffers from muscular dystrophy and uses a wheelchair. As another lawmaker cast an electronic vote on her behalf, he mockingly asked her if she needed help. Hazan, 34, says the media is on a witch hunt. Hazan denied insulting Elharar and said he was merely protesting what he considered to be the casting of an illegal double-vote by her neighboring lawmaker. It’s an issue that Hazan is quite familiar with. 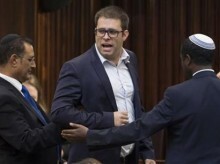 His father, former Likud lawmaker Yehiel Hazan, was convicted of forgery, fraud and breach of trust after double-voting in parliament in 2003 and attempting to cover up the evidence in an embarrassing incident caught on parliament’s security cameras. The son’s introduction to the public was in a campaign ad early this year where his cigar-smoking father, trying to make light of his earlier transgressions, dressed up like a mafia boss and asked him to avenge his dishonor. Hazan surprisingly slipped into parliament last March when Netanyahu’s Likud exceeded expectations and gained several more seats than forecast. At the time, he was lowest-ranking member on the party’s list of candidates to win a seat. Almost immediately, a deluge of drama followed. First, police recommended Hazan face charges for assaulting a City Hall official in his hometown, the West Bank settlement of Ariel, in 2014 after a lien was placed on his bank account to collect an outstanding debt. Then a number of women told the media he sexually harassed them when they worked for him at a Tel Aviv bar. A dovish Israeli advocacy group said Hazan tried to dupe them by providing false testimony detailing fictitious human rights abuses by Israeli soldiers in the Gaza Strip. “Breaking the Silence” said it didn’t fall for Hazan’s attempt to discredit them and didn’t publish his falsified account. His dubious reputation took another hit in June when Israel’s Channel 2 TV ran an investigative piece that included testimony Hazan had pimped prostitutes, consumed crystal meth and provided it to Israeli tourists while running a Bulgarian casino before he entered politics. Although Hazan has not been charged with any crimes, that report, coupled with aggressive outbursts toward others in parliament, led to condemnations even from within the Likud Party. While no one has come to Hazan’s defense, most Likud members have remained silent, apparently intimidated by the family’s considerable influence in Likud’s various internal bodies. Eli Sulam, chief executive of the nonprofit Movement for Quality Government in Israel, said Hazan is unique because he is loathed not for his ideology but rather for his conduct and character. “It’s a type of sewer culture that is unacceptable in any Western parliament in the world and one that we have never seen here before,” he said. The repeated scandals inspired Israel’s top comedy show, Eretz Nehederet, to introduce a popular imitation with a Hazan lookalike, sporting thick-framed glasses and a toothy grin, making vulgar and inappropriate comments. Hazan denies all the allegations against him. He has sued Channel 2 for defamation and says he is the victim of a slanderous media campaign. But he also seems to be relishing the attention. He’s an eager interviewee, has been a fixture on TV news shows and even a willing participant in another late-night comedy show where he was mercilessly roasted. During a phone interview, he briefly paused to pose for a selfie that a saleswoman requested. Because Hazan is an elected lawmaker, there is no legal recourse to fire him. But the most recent incident has stepped up pressure to try to sideline him. Opposition lawmakers say they will appeal to parliament’s ethics committee to suspend him and will refuse to take part in parliamentary activities with him. Edelstein, the speaker from Likud, was equally forceful, calling Hazan a “loose cannon” who “crossed a red line.” He has encouraged coalition members to take action against him as well.